Workers search for casualties at the site of the crash of United Flight 34 on a mountaintop south of Newhall. The plane crashed at 7:38 p.m. Sunday, Dec. 27, 1936, and wasn't discovered until 10 o'clock the next morning, so this is probably the evening of Monday, Dec. 28. There were no survivors. United Air Lines Flight 34 out of Oakland — a Boeing 247-D, registration number NC13355 — crashed into a mountaintop in Rice Canyon, two miles south of Newhall, at 7:38 p.m. on Dec. 27, 1936, one minute after it was scheduled to arrive at its final destination in Burbank after stopping in San Francisco. All 12 persons on board were killed — Pilot Edwin W. Blom, Co-pilot Robert J. McLean, stewardess Yvonne Trego and nine passengers including H.S. Teague, a 28-year-old cartoonist for Walt Disney Studios. 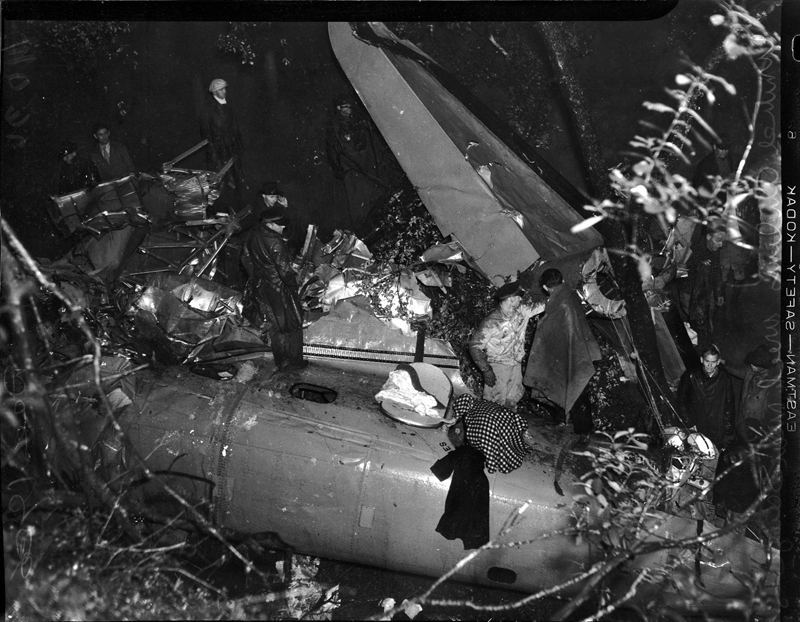 It was the first of two fatal crashes of Boeing 247-D's in the mountains south of Newhall within a three-week period. In light rain and scattered clouds, NC13355 hit the ground (elevation 2,620 feet) at a 28-degree angle and spun horizontally 307 degrees, shearing off both wings and the right-hand landing gear. The fuselage, with the rest of the landing gear down, skidded another 300 feet, hit the canyon wall and slid to the bottom of the canyon, 200 feet lower than the ridgeline. According to the accident report, the pilot acknowledged that he picked up the Saugus beacon and was coming in for a landing at Burbank. At 7:36 p.m. the copilot requested that the localizer at Burbank be turned on (the airline's low-power radio frequency); this was done and the co-pilot said, "Just a minute." This was the last communication from the aircraft. "There was nothing in the manner in which this message was given to indicate the slightest alarm," the accident report states, "and it suggests a desire on the part of the co-pilot to delay giving the requested position report until the [final] turn had been completed." It states: "The evidence ... suggests that after getting into the pass at an altitude lower than is permitted for an instrument approach, the pilot decided that conditions were not favorable for flying through the pass by visual contact. It was raining at the time and broken clouds probably partially obscured the airways beacon light on the high point in the pass at times. It is also probable that static was encountered in these clouds." There were no witnesses. The airplane was discovered at 10 a.m. the next day. "A careful examination of the wreckage failed to indicate any structural failure of the aircraft," the report states. It had plenty of fuel, both engines were operating at cruising speed or better, and the landing gear — what was left of it — was in working order. "It is the opinion of the Accident Board that the probable cause of this accident was an error on the part of the pilot for attempting to fly through the Newhall pass at an altitude lower than the surrounding mountains without first determining by radio the existing weather." E.T. Ford of San Marino, Calif.
Mrs. E.T. Ford of San Marino, Calif.
John Korn of El Centro, Calif.
Alex Novak of El Centro, Calif. According to the Boeing 247 book, NC13355 started life as a standard Boeing 247 on Aug. 18, 1933, when it was registered to Boeing Air Transport. The Air Mail Act of 1934 prohibited aircraft manufacturers from owning airlines that carried mail, so Boeing spun off a new company, United Air Lines Transport Corp. Like others in the fleet, NC13355's registration was changed to UAL on May 1, 1934. On Sept. 12, 1935, the aircraft was converted to a Model 247-D, which is distinguished by a rear-swept cockpit windshield, geared Wasp engines and NACA cowls. SW3602: 19200 dpi jpeg from digital image, Los Angeles Times Photographic Archive, Department of Special Collections, Charles E. Young Research Library, UCLA.